The new helmet is available in several versions and thus responds to all extreme applications. The new quick adjust system of this product, called the Ratchet System, reinforces the multifunctionality of the helmet without compromising comfort. Forest fires : Endowed with tinted lens goggles, retro reflective stickers and perfectly vented: the most suitable helmet for forest fire-fighting. Traffic : The same helmet, but not vented, not necessarily with goggles and in a color of the wearer's choice, corresponds perfectly to the multiple risky situations on roads and highways. 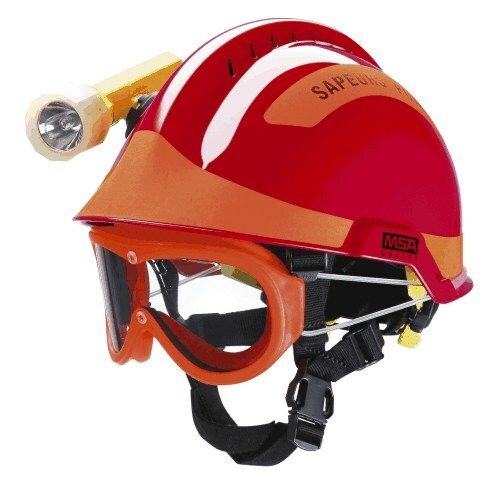 Rescue work in hazardous environments : The same vented helmet, not necessarily with retro-reflective stickers, according to needs, is certified according to the EN12492 alpinist standard to operate in rescue situations in a hazardous environment. Industrial risks : Non vented, and dialectrical insolated, the helmet responds to the EN397 standard and can be used in all industrial environments to protect against shock and sharp falling objects, as well as against chemical risks.